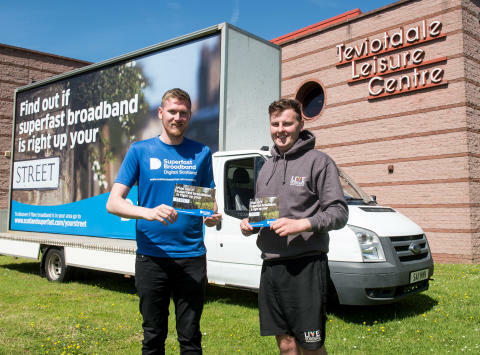 Digital Scotland's Stephen Chambers and Greg Aitken of Teviotdale Leisure Centre are pictured in Hawick this week. More premises across the Scottish Borders can now upgrade to faster fibre broadband through the £428 million Digital Scotland Superfast Broadband rollout. Thanks to the programme, more than 890,000 premises are able to connect to the new network, which has now arrived in Nether Blainslie, Gordon and Smailholm for the first time. Other areas to receive further deployment include Duns, Lilliesleaf and Paxton. Local people need to sign up for the new, faster services with an internet service provider, as upgrades are not automatic. To help promote the fact that fibre is widely available in the Scottish Borders the Digital Scotland Superfast Broadband team were out Hawick, Cockburnspath and Eyemouth this week. As part of the local rollout in Scottish Borders some ultrafast Fibre-to-the-Premises (FTTP) technology is also being deployed. FTTP sees fibre connected directly from the exchange to the premise and is capable of carrying speeds of up to 1Gbps2. FTTP is being deployed by the programme in only a handful of areas where it is the best technical solution for the area. Some properties in places like Lilliesleaf, Roxburgh, Philiphaugh, Bowhill, Crailing and Paxton are among those to benefit. Councillor Mark Rowley, Scottish Borders Council’s Executive Member for Business and Economic Development, said: “I’m encouraged to see some more areas of the Scottish Borders can access fibre broadband thanks to a programme to which Scottish Borders Council contributed an additional £8.4 million. “Many of these latest lines have been converted from a format once thought incompatible with high-speed fibre broadband, and we’re increasingly using ultrafast Fibre-to-the-Premises (FTTP) to deliver the network directly into individual dwellings. “Finally, we are still bringing fibre to small communities like Gordon for the first time.